Just for fun a sporty pair of bloomers from team TMJ....maybe a cool down outfit after a training? Brianna Read, the creator of Jack of Diamonds, whipped up the knitted top (called the Doublet Redux) especially for my shoot...she was darning in the threads as I arrived. Brianna creates beautiful made to measure knit garments and also hosts classes for small groups in her studio. Three per class is ideal; you can walk in a machine knitting novice and leave with a beautiful garment under your arm! To give my BLOOMER more fullness I cut the sample in a size 12. For the leg and waist openings I used a satin bias binding in red and then threaded it with elastic cut to fit my model. The pattern for the BLOOMER is available in sizes 8-14 from my Etsy shop. 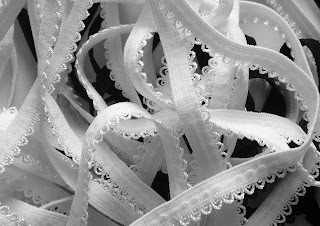 The fabric, called Kissing Hearts, came from Tessuti and the ribbon was found at L'uccello. Oh actually I got the name wrong, it's called the Doublet(pronounced doo-blay) Redux...sorry Brianna! Check out a website called www.purrfectpineapples.com you'll like it a lot! Copyright 2012, The Makers' Journal. Simple theme. Powered by Blogger.